FGC BOLSA - FGC FINANCIAL MARKETS INFO: Markets I WSJ: Investors Confront Growth Fears Ahead of G-20 Summit. Markets I WSJ: Investors Confront Growth Fears Ahead of G-20 Summit. Hello. Amrith Ramkumar here with The Wall Street Journal, getting you up to speed on today's markets news. Stock futures are sliding after Monday's rise for major indexes. Investors are monitoring speeches from Fed officials, and Salesforce.com posts quarterly results after the bell. Plus, I explain why tepid global economic data are increasing attention on an end-of-week Group of 20 summit. President Trump told the Journal he expects to move ahead with boosting tariff levels on $200 billion of Chinese goods to 25%, calling it “highly unlikely” that he would accept Beijing’s request to hold off on the increase. Global stocks were mixed Tuesday, with early-week optimism dampened by comments from the White House that its tariff plans were unlikely to change. Data are increasing focus on trade tensions between the U.S. and China. The Citigroup Economic Surprise Index for developed markets, a measure that tracks whether economic reports are meeting projections, has fallen to its lowest level in almost six months. The gauge is in negative territory, meaning data are broadly starting to come in below economists’ expectations. A similar index for emerging markets has been in negative territory for the most part since June. President Trump and Chinese President Xi Jinping are expected to discuss the U.S.-China tariff fight that has dragged on for much of this year. The negotiations represent a wild card for the markets because a resolution to the trade dispute could brighten the outlook for the global economy. If Messrs. Trump and Xi fail to reach a deal, that could continue to add pressure to equity and commodity markets, analysts say. Worries about the global economy have sent U.S. stocks and oil lower in recent weeks. Even though many stocks and commodities rose on Monday, the S&P 500 is 8.8% below its September all-time high. Meanwhile, oil and several industrial metals are in bear markets, down more than 20% from recent peaks, a sign that sentiment has declined sharply. IHS Markit said last week that its composite Eurozone Purchasing Managers Index fell to its lowest level in almost four years. Data earlier this month showed economic output in Japan and Germany contracted in the third quarter, while in October consumer spending in China hit its slowest pace in five months. The U.S. has been a rare bright spot for the global economy this year, but some analysts expect its growth to slow as a boost from recent tax changes fades. Economists expect the second reading of third-quarter U.S. growth to come in at 3.5% Wednesday, in line with preliminary figures from last month. That’s down from 4.2% in the second quarter, and some expect the pace to cool even more in the future. “People have been paying attention to the global slowdown for foreign markets all year,” Mr. Hans said. “It’s coming to the forefront now simply because the U.S. had been carrying the ball." Are you adjusting your portfolio because of weakening global growth? Let the author know your thoughts at amrith.ramkumar@wsj.com. Emailed comments may be edited before publication in future newsletters, and please make sure to include your name and location. Microsoft is close to becoming the most valuable U.S. company for the first time since 2003, according to Dow Jones Market Data. If the software firm eclipses Apple in market value, it would knock the iPhone maker off the top spot for the first time since 2016, when Google parent Alphabet briefly topped Apple. Apple is valued at $829 billion, while Microsoft is at $817 billion and Amazon.com is at $773 billion. Bitcoin is down more than 42% this month, on pace for its worst month on record, according to Dow Jones Market Data. The S&P 500 consumer discretionary sector rose more than 2.5% in a single session for just the fourth time this year on Monday. The group added 2.6%, lifted by retail stocks as shoppers spent billions of dollars online and in stores over Thanksgiving weekend. The S&P/Case-Shiller home-price index for September is out at 9 a.m. The Conference Board's consumer confidence index for November, out at 10 a.m., is expected to fall to 135.8 from 137.9 a month earlier. The Chicago Fed's Charles Evans, Atlanta's Raphael Bostic and Kansas City's Esther George speak at the Clearing House's annual conference at 2:30 p.m. The outlook for Fed rate policy in 2019 is wide open. 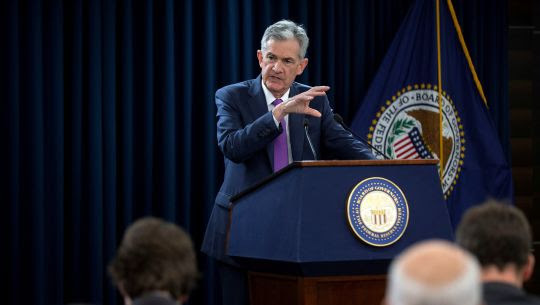 The central bank will be deciding whether and when to raise interest rates more on the basis of the economy’s latest signs—such as in inflation, unemployment and growth—and less on the long term. The housing boom is coming to an end, starting in Dallas. The Texas city is housing’s “canary in the mine shaft.” Homes are taking longer to sell, bidding wars are rarer and price cuts are more common as buyers absorb the impact of higher mortgage rates. GE bonds rebounded as bargain hunters swooped in. The move eased some of the losses debt investors have taken as doubts about the conglomerate’s financial stability spread through financial markets. Bitcoin is continuing its steep fall as the crypto collapse worsens. Bitcoin slumped 10% Monday, continuing a steep slide and bucking a modest rebound in stocks and oil. Last week, it lost nearly a third of its value in seven days, one of its worst weekly selloffs on record. United Technologies plans to break itself into three companies. The company said Monday it plans to spin off to shareholders its Otis division and Carrier building systems businesses. GM’s plan to drop Chevy Cruze hit an Ohio town hard. Word that General Motors will stop making the Chevrolet Cruze next spring and likely lay off 1,600 workers at its Lordstown plant traveled quickly, as workers, elected officials and other businesses assessed the plan’s impact. Apple: President Trump told The Wall Street Journal that the U.S. could place tariffs on iPhones and laptop computers imported from China, depending on how trade negotiations proceed. Bristol-Myers Squibb: The company reported that a lung-cancer treatment failed in a clinical trial. Buckle: The fashion retailer said sales fell 4.1% in the most recent quarter, a bigger drop than Wall Street anticipated. MTS Systems: The maker of test systems and industrial position sensors reported a larger-than-expected drop in quarterly revenue.